This article is for the V-belt on a 1981 Jeep CJ7. The jeep does not have a serpentine belt and it does not have an automatic belt tensioner. Belts on an engine are used to power essential items and accessories like the alternator, power steering or air conditioning. My 81 CJ7 has a 2.5L engine and there is only one belt. The Jeep does not have accessories like power steering or air conditioning so the single belt is used for the alternator, water pump and cooling fan. About a year ago I drove the Jeep through some fairly deep water during a thunderstorm and shortly afterwards I had to replace the alternator. Prior to that the belt rarely made any noise. After replacing the alternator the Jeep developed an ongoing problem with a squealing belt. Belts can squeal for several reasons. The belt can slip on the pulley, it can be out of alignment, the belt tension can be out of adjustment and the belt or the pulley(s) can be old and worn out. My first attempt at fixing the problem was to adjust the belt tension. In the military we would simply press our thumb in the center of the belt, between two of the pulleys, and if there was 1/2 inch to one inch of deflection it was within adjustment. After I adjusted the belt it continued to squeal every now and then. My next attempt at correcting the problem was checking and adjusting the belt alignment. It looked as though the belt might be slightly out of alignment, so I used washers between the alternator and the bracket until the belt looked perfectly in line with the pulleys and the alternator. After correcting the alignment the belt still squealed periodically. My third attempt at fixing the noisy belt was to remove and inspect the belt and the pulleys. What I discovered was the belt and the pulleys were glazed. My thought was the heavy glazing probably caused the belt to slip, making the squealing noise. I rolled up a piece of sandpaper so it fit in the groove of the pulleys and sanded both pulleys unit the glaze and rust was removed down to bare metal. I bought a can of black high-heat engine spray paint and painted two coats on both pulleys. I wanted to make sure the paint had plenty of time to dry and cure before testing it, so I let it sit for 48 hours. I bought a new v-belt, installed it, adjusted it and started the Jeep. No squealing. I drove the Jeep and there was no more squealing. Problem solved. I just wish I checked the belt and pulleys first! While I waited for the engine to get back from the machine shop I decided to do more front end work. I installed the Pro Comp 4-inch lift on the front suspension and thought this would be a good time to inspect and repair the Jeep’s front end, especially with easy access like this. By the look of things I was convinced none of this has been touched since the Jeep was new. I decided to replace the 36 year-old ball joints, the U joints in the front axles, go through the front hubs, repack the wheel bearings and check the brakes. I also want to drain the front axle, replace the pinion seal and refill the axle with new gear oil. I plan to use this Jeep as a daily driver so fixing things now will save me headaches down the road. The first step, after jacking it up and removing the tires, was to remove the brake calipers, the brake rotors, disassemble the front hubs, remove the spindles and the axles. Other than dealing with some rusty bolts it came apart fairly easy, and I was surprised to see a good amount of grease on the bearings and front hubs. But now that it’s apart it only makes sense to clean the wheel bearings and races so I can check their condition and then repack the bearings and replace the wheel seals. I realized the only way I was going to remove the lower ball joint was by removing the entire steering knuckle. I used a small pitman arm puller to separate the tie rod ends from the steering knuckle. I usually use an old pickle fork but this new puller worked great. I did need to use the fork to break the ball joints loose from the steering knuckle though. Eventually I got the steering knuckles removed and can do the rest of the job at the vice. I rented a ball joint remover set from the auto parts store and soon discovered it wasn’t ideal for removing Jeep CJ7 ball joints. It took a little creativity to make the tool work and to figure out which ball joint to remove and then install first so I had room for the tool. After getting the new ball joints pressed in I decided to use the ball joint tool to remove the old U joints from the front axles before turning the tool in. I got the new ball joints pressed in. Now it will take another day or so to clean all these parts up, sand, prime and paint some things and to do the reassembly. All in all I’ll be glad I did this after the Jeep is all put back together. Next I want to remove the T176 transmission and try to figure out why it’s popping out of gear. I never rebuilt a manual transmission, but I am considering it after seeing how much they charge for a rebuild. I can get the rebuild kit for about $130 and they want $800 to $1000 for a rebuilt T176. That seems ridiculous to me unless it’s a lot harder than it looks. I am anxious to get started on my 65 Dodge Coronet 500 build, but first I need to get my 1980 Jeep CJ7 project finished. I found a good deal on a 1980 CJ7 with a 304 and power steering, so I picked it up. My plan is to do a clone of the 79 Silver Anniversary Renegade. It will be a daily driver, so the restoration does not have to be show quality. I want to rebuild the 304 engine and install a 4-inch Pro Comp lift I have at the shop. The transmission pops out of gear so I will more-than-likely rebuild it and then go through the brakes, hubs, and axles. When the Jeep it is mechanically correct I will finish the body work and paint to match a 79 Silver Anniversary Renegade. The first step was to get the front end off the Jeep for easy access to the engine. I made room in the shop for the Jeep and got busy removing the front end. Removing the front end serves several purposes. I can access the engine easier, start on rust repair on both front fenders, clean and prep the firewall and front frame section for primer and paint, and when I get ready to paint the Jeep I have access to everything so no red paint will be noticeable when it’s finished. The Jeep does not have a lot of rust, but there are a couple spots on the fenders and grill that require some patch panel fabrication and welding. With the front end off I got the engine out and disassembled it to have a look inside. I was hoping I could do a basic rebuild and use any parts that were still in good shape. When I got the pistons out I noticed a pretty large ridge at the top of the cylinder walls and my hopes of using existing parts quickly diminished. The cylinders would need to be bored, so the engine will get a complete engine rebuild kit. These old 304 engines did not put out much horsepower, especially by 1980. I am hoping to squeeze a few more horsepower out of it by adding a mild cam, headers and a slightly bigger carburetor. Depending on the budget I might spring for a new intake as well. I loaded the engine parts in the truck and headed to my favorite machine shop. The machine work will take awhile so I got busy installing the Pro Comp 4-inch lift while the engine is out of the Jeep. I also started welding some small patch panels in and doing some of the body work. At some point in time somebody painted over the original red color with a lavender color and the paint is difficult to sand. I am not looking forward to sanding the entire Jeep but there is no way around it, especially when you plan to change colors completely. Bodywork and rust repair are probably my least favorite jobs during a restoration, but if you are going to do it you might as well do it right. I learned along time ago if you don’t fix rust the right way it is just a matter of time before it starts coming back through your new paint job. The best way to deal with it is to cut it out completely and weld new metal it its place. This stops the rust from spreading and you use less filler when you do the body work. Impartial Services Group (ISG), now Stericycle, is a large third party organization that assists other companies with services including recalls, retrieval, returns, and audit solutions. I never heard of ISG prior to November of 2015, but now I have first hand dealings with the organization. One service ISG offers automakers is to manage and facilitate vehicle repurchases, and one of those automakers is Fiat Chrysler Automobiles. In February 2015 I purchased a brand new 2014 Ram 2500 mega cab truck. To make a very long story short, after four trips to the dealership, for transmission related problems, Chrysler contacted me with an offer to repurchase or replace the vehicle. This is how I came to know of ISG. The Chrysler representative told me that within 3 to 5 days I would be contacted by an ISG representative who would explain the entire replacement process to me. Little did I know this experience would turn out to be one of the worst experiences I ever had, when in reality it could and should be a much better experience. The ISG operation reminds me of typical bureaucratic behavior. 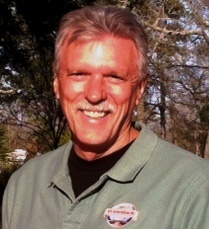 I dealt with my fair share of bureaucracy during my career in the U.S. Army, which is quite common in government run organizations. One dictionary definition for bureaucracy is; a system of administration marked by officialism, red-tape and proliferation. When an organization devotes excessive time, reverence and adherence to official procedures and regulations it breeds bureaucracy. And when an organization “is too big for its own good” as the saying goes, good management practices can get lost within the organization itself. To explain the inexcusable experience I had with ISG would require devoting an entire white paper to the topic. I do not have the time, so I will sum the experience up using bullet points. Back in the day Dodge and other automobile manufacturers were building and selling what basically amounted to factory race cars. 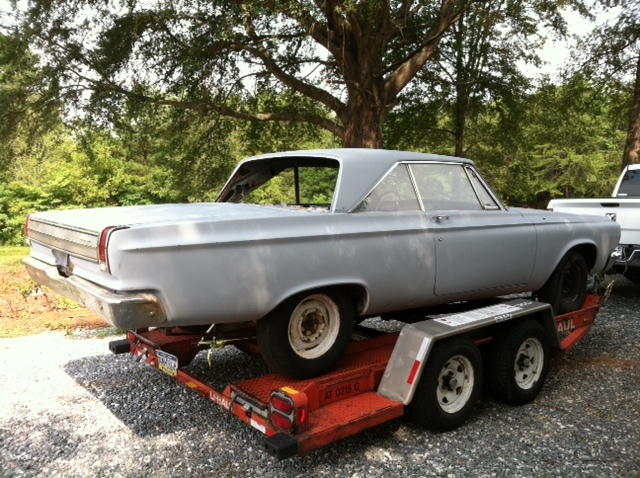 My 65 Dodge Coronet 500 is a good example of an early Mopar factory race car. Take a small light-weight car, shove a 426 street wedge big block engine in it, add some bigger brakes and limit optional equipment to avoid additional weight and you have early Mopar muscle built with one thing in mind. My 65 Coronet is a super rare (one of 440) Dodge Coronet 500s that came equipped with a 426 street wedge engine and 727 automatic transmission, and it’s numbers matching. The 426 street wedge was only used in 64 and 65. To limit weight it came with almost no factory options. When you decode the fender tag the only optional equipment was variable speed wipers, black vinyl top, heater with defroster, AM radio, back-up lights, and front bucket seats with a console. Most people view it as a plain Jane 65 Coronet, whereas I see it as a true Detroit muscle car. These cars were the beginning of the muscle car era, in which I grew up in. This is one car I won’t let get away. 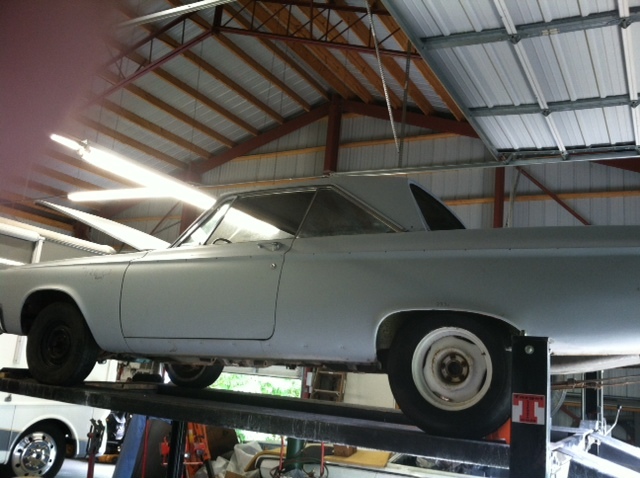 Comments Off on Project 426 Street Wedge – Why is this 65 Coronet 500 Bare Bones? 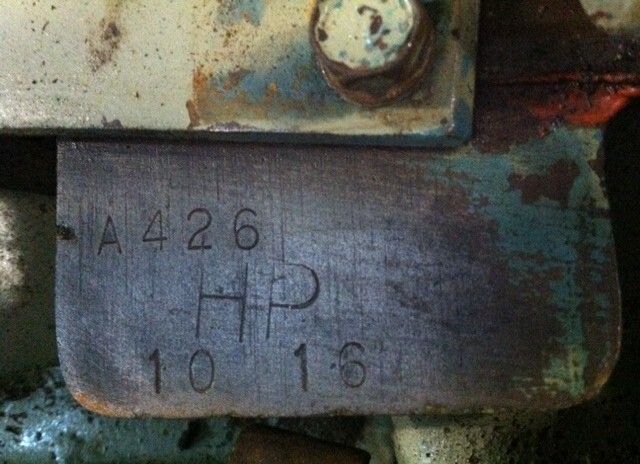 Comments Off on Project 426 Street Wedge – Is it a Numbers Matching 65 Coronet 500? Dodge Coronets are one of my favorite cars. They reintroduced the Coronet name in 1965 and for most people the popular models were 67 through 70. I personally always liked the 65 Dodge Coronet 500, especially when it came came from the factory with a 426 wedge engine. Do not confuse this 426 CI engine with a max wedge or the notorious 426 hemi; I’m talking about what is commonly referred too as a 426 street wedge. It was a 2 year engine and Chrysler built the 426 wedge to be more “street friendly” than the max wedges, and to compete against Ford and GM’s engines and cars of the period. The 64 and 65 street wedge engines came equipped with a single four-barrel carburetor, hydraulic lifters, and a 10.3:1 compression ratio. The engine was rated at 365 horsepower at 4800 rpm, and 470 pounds/feet of torque at 3200 rpm. It was the largest displacement engine of its time. 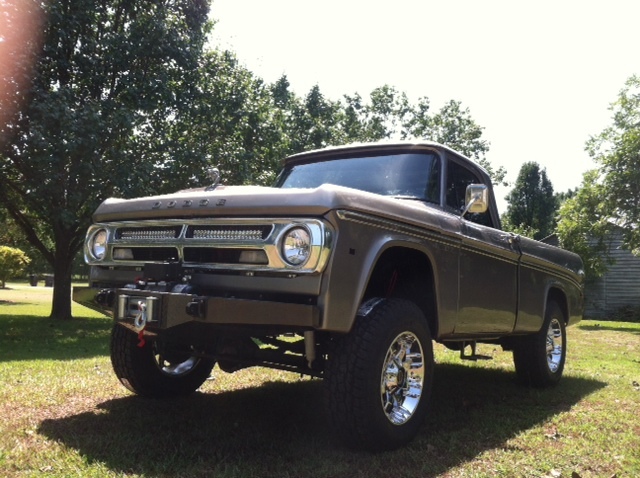 I was finishing the 71 Dodge Power Wagon build so I started checking Craigslist and other sites for a muscle car project. It wasn’t long before I found an ad for a 65 Dodge Coronet 500 and it claimed to have a numbers matching 426 wedge engine, 727 transmission and 3.23:1 rear axle. It is nearly impossible to find a 50 plus year old car that still has the original running gear so I was a bit skeptical about the ad. After some research I discovered in 1965 Chrysler sold about 33,000 Dodge Coronet 500s and of those only 440 came with the 426 street wedge engine and 727 automatic transmission. Of the 440 built in 1965 I would venture to say there are only a handful in existence today with the original running gear. As an added bonus this 65 Coronet was in North Carolina, about 5 hours from where I live. After numerous emails and phone calls I made arrangements to go look at the car, and my thoughts were if I could verify some numbers on the car it was coming home with me. When I got there the first thing I checked was the VIN plate. W=Coronet V8, 4=Coronet 500, 5=1965, 1=Lynch Rd. Michigan. If it was the actual VIN plate it was a 65 Dodge Coronet 500. Next I verified the fender tag displayed an “80” engine code which means the car came from the factory with a 426 wedge engine. 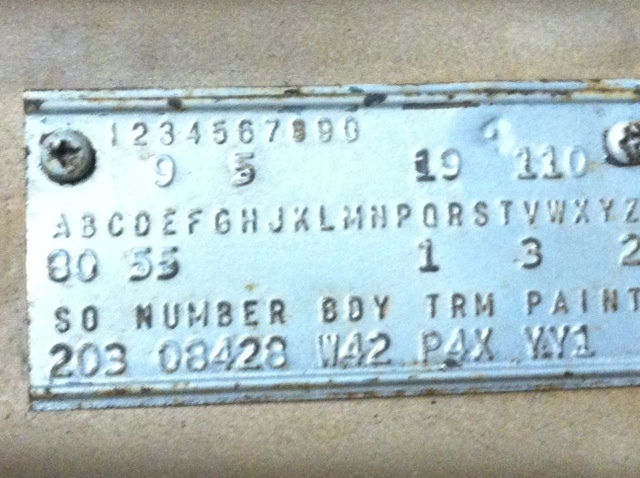 The “80” is under AB on the middle line of the fender tag. Other information from the tag let me know it was a Coronet 500, it had an automatic transmission, the original color was medium tan poly and the trim was black vinyl. 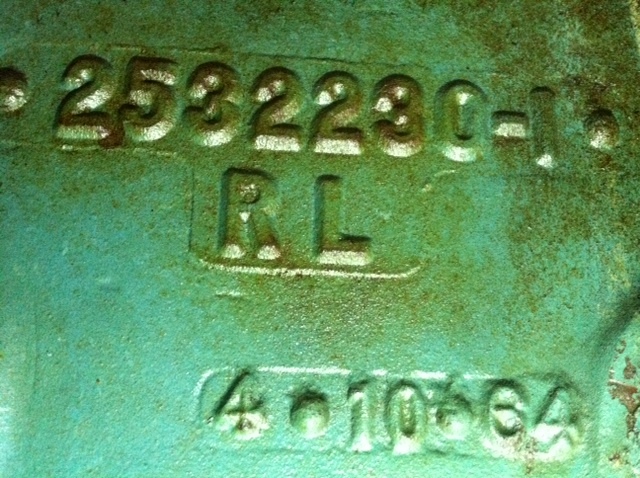 The “SO” or Shipping Order number showed a scheduled production date of 03 February 65 for the car. 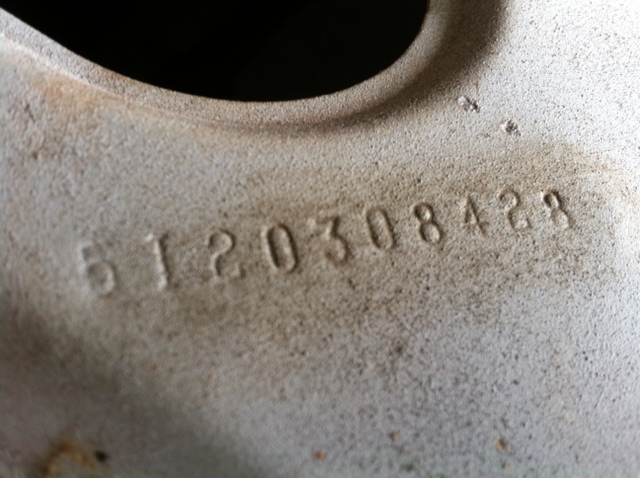 It was common for manufacturers to stamp the Shipping Order “SO” number found on the fender tag in hidden places on the car, so I started searching. Places to check are the radiator core support, the lip under the trunk seal and the panel behind the rear seat. I found the hidden matching number on the package tray located behind the back seat. If you look closely at the picture you will see 20308428 on the panel and the tag. These hidden numbers were put on cars to help identify fraud and it helps in situations like this when you want to verify a cars provenance. My final check was the engine ID pad located on the front of the engine next to the distributor. It was marked A426 HP 10 16. The “A” meant 1965 and it was a 426 CI engine. At this point I knew the car was a 65 Coronet 500 that came from the factory with 426 street wedge engine, and it had a 426 wedge engine in it that was dated 1965. It would take more investigating to verify if it was in fact a “numbers matching” car but for the negotiated price we settled on the car was coming home with me either way. In my next post I will expand on authenticating the car, engine and other components. I started the Sweptline Semi-Hemi project in early 2013. Sometimes I was able to work on the truck 2 or 3 days a week, and sometimes it sat untouched for weeks at a time. 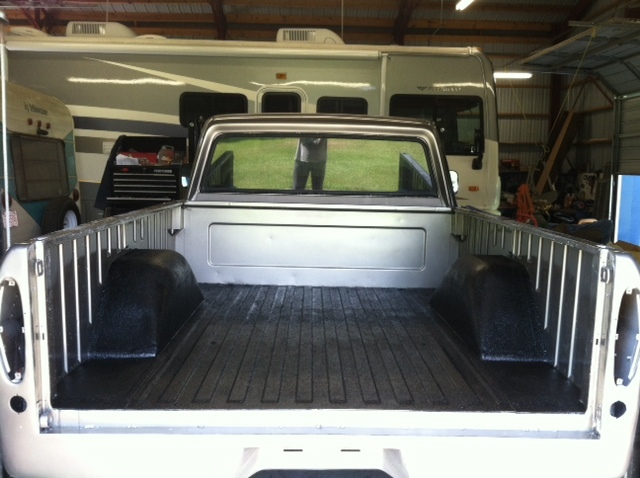 Now, as impossible as it seems the 71 power wagon is nearing completion. The last major step is the exhaust system, and there are lots of little things to complete and double check, but I see a bright light at the end of the tunnel. Recently I finished most of the wiring, installed the new tires and wheels and started putting the chrome back on the truck. I want to do one final buff on the paint and when I get it back from the exhaust shop I will test drive it and work out the bugs. I have done everything on this restoration myself with the exception of changing the gear sets in the front and rear axles, the exhaust system and the cab paint, which the guy I paid to paint the cab screwed up. 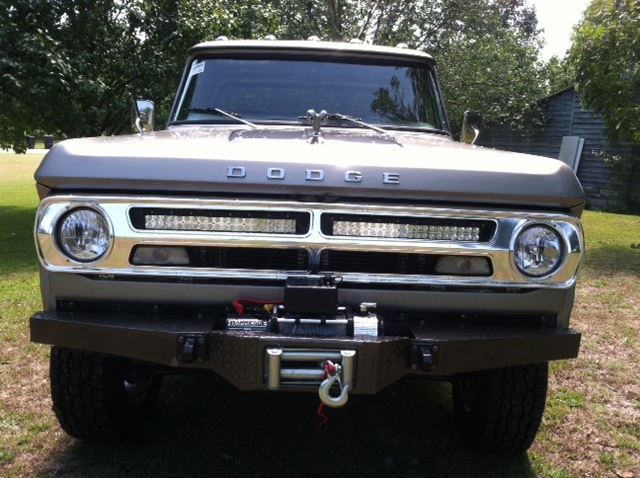 This restoration was more difficult than most because there are very few replacement parts available for these old Dodge trucks, but that was part of the challenge and the fun. 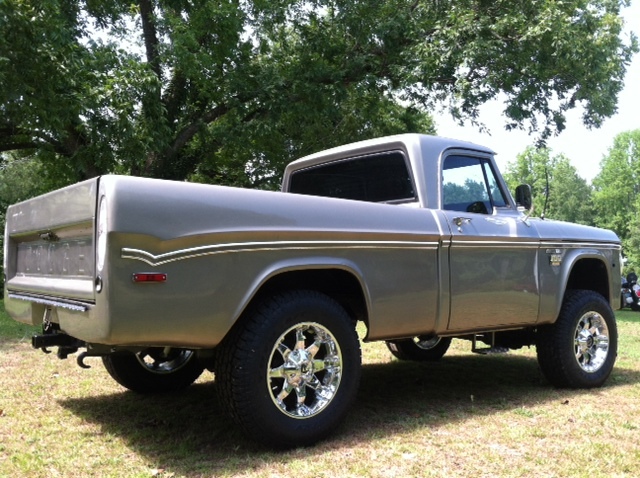 I can hardly wait to get the semi-hemi project truck on the road. When I painted the bed of the truck my initial thoughts were to have a bed liner professionally sprayed in when the truck was finished. 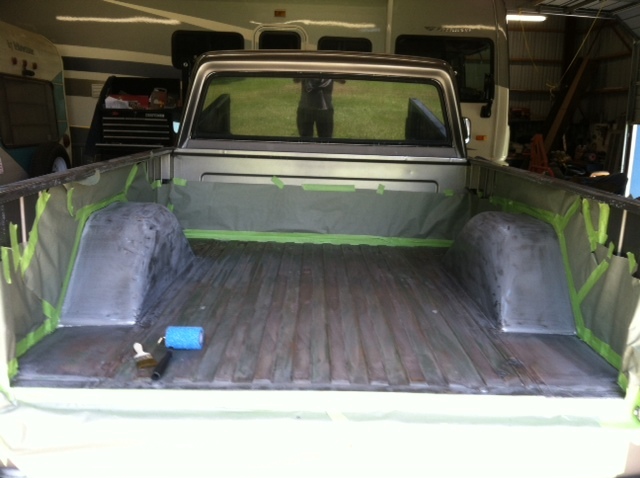 At the last minute I decided to prep and paint the inside of the truck’s bed, but not the floor. 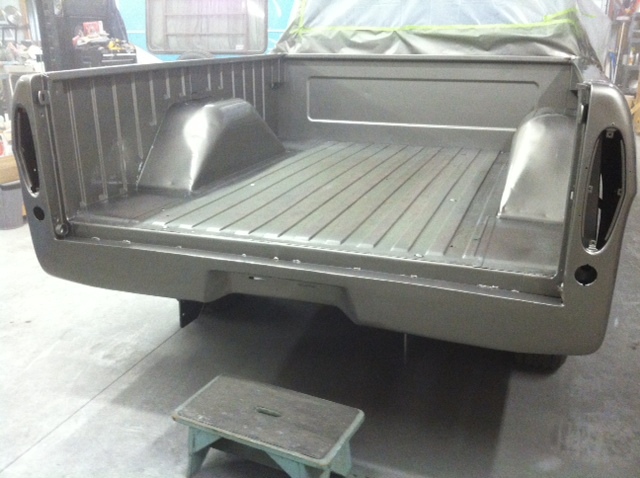 I thought it would be kind of neat to do a bed liner on the floor, wheel wells and tailgate, but leave the inside sides of the truck bed the same color as the rest of the truck. 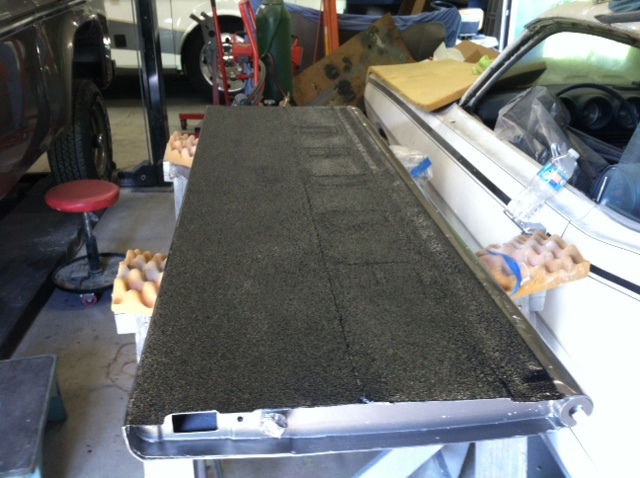 I have done several bed liners in the past, some were spray in products and others were rolled and brushed in liners. I was going to have it done professionally, but now, towards the end of the truck restoration project, my budget is dwindling fast. I was never a big fan of of the roll-on bed liners because of past experiences, but after visiting three local auto parts stores there were no spray in products available. I was impatient and did not want to order a product online and wait for it to arrive, so after researching some roll-on bed liner products I decided to try a Herculiner bed liner product. I prepped the bed by washing it really good, welding some old holes closed that were drilled in the floor, and sanding the entire surface. After that was done I taped off the areas I didn’t want the bed liner to get on, and I used compressed air to clean out any remaining debris. The final step to preparing the surface was to wipe everything down using a wax and grease remover. I did the same prep process on the inside of the tailgate. Next I stirred the bed liner using a drill attachment, to really get the particles suspended in the can. The Herculiner kit included one gallon of bed liner, two textured rollers, and a small paint brush. I used some disposable gloves to keep it from getting all over my hands. I started by brushing the product in all the seams and corners and then used the roller to apply a light to medium coat over the entire surface of the bed and the tailgate. I stirred the product frequently to help keep the particle suspended in the can. I let the product dry for about 2 hours, until it wasn’t tacky to the touch, and applied a heavier coating over the entire surface. I have used roll-on bed liners before and was not pleased with the outcome, but I really like the Herculiner roll-on product. It covered the surface nice, with an even texture, and the finished product looks great. The only thing left to do is see how it stands the test of time.